I enjoy the contrasts between the ABT fall and spring seasons. The spring season presents full-length classical ballets featuring a limited number of leading dancers providing the bulk of the dancing and dramatic action. By contrast, the fall season showcases a wider range of dancers and repertory. This diversity was on display Friday when ABT performed Les Sylphides, a Michel Fokine work from 1909 set in the Romantic era, and modern works Bach Partita and Gong by Twyla Tharp and Mark Morris, respectively. The single male in the work is Thomas Forster a member of the Corps getting a shot at a principal role. He was attentive in his partnering of Isabella Boylston, Sarah Lane, and Hee Seo. However, at times during his solo, his upper body was tense, resulting in a slumped over upper body. Sarah Lane was my favorite in this work; the carriage of arms and upper body are key in this ballet and she pulled it off well with light, flowing, airy movements coupled with nice controlled arabesque turns. ABT performed the revival premier Friday. The piece is set to Bach’s Partita in D minor, “…a thirty-minute virtuoso showpiece for solo violin. It is considered one of the greatest works ever written for the instrument,” according to Harsse. 25-year old Charles Yang was at the helm, standing on a raised platform, facing a monitor so he could see what the dancers were doing. I didn’t see him looking at music sheets. Did he commit the entire 30-minute piece to memory? The leads were Polina Semionova/James Whiteside, Gillian Murphy/Marcelo Gomes, and Stella Abrera/Calvin Royal III. The piece is indeed complicated, with the leads performing in short bursts to be replaced by other leads and cast members. Sometimes the leads would perform together, on their own, and with other cast members. 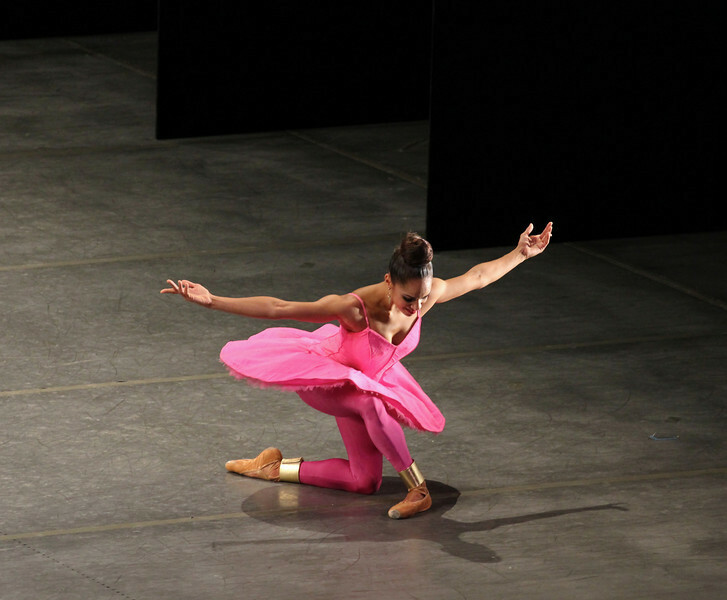 Other cast members included Misty Copeland, Joseph Gorak, Luciana Paris, and Craig Salstein. Gillian Murphy stood out, making full use of per prodigious turning skills. With Marcelo, her finger turns and supported turns seemed to last forever with the music her only limitation. Polina and Whiteside made a good pair. At one point, I thought that Polina grazed Whiteside’s head with a long-reaching arabesque as he supported her. This may be an occupational hazard dancing with the limber and long-legged Polina. She is one of my favorites with her great line and expressiveness. I’ve only seen Whiteside once, as Ali the Slave in Le Corsair. He does have very quick, rapid turns and an aggressive style, although I am not completely sold on his dancing due to his unique mannerisms. Stella excelled at the rapid footwork and worked well with Calvin. They had an intricate and unique partnering section that drew a few gasps from the audience. Like Forster in Les Sylphides, Calvin is a Corps member and it is nice to see younger members getting top billing. His dancing was technically solid but not exciting, a trait that he will likely develop with seasoning. The bows were emotional as Twyla and Jones made appearances on stage and exchanged hugs, along with the dancers and violinist Yang. I enjoyed this piece and, given all the work that went into the revival, it would be a shame to wait another 28 years to see it again. Mark Morris’s Gong, created for ABT in 2001, closed out the evening. This was the second Friday evening in two weeks that I’ve seen a Morris work-two weeks ago San Francisco Ballet performed Beaux. Gong, like Beaux, features brightly colored, humorous costumes by Isaac Mizrahi. With my sweeping view of the stage from the second balcony, my brain tried to keep track of all of the combinations of dancers as they hurriedly entered and exited the stage, seeming to go somewhere. It seemed chaotic, but in an organized way, if that makes any sense. After several segments of loud, discordant music, the lights dimmed and a couple danced in silence to a dark stage lit by three side lights. I couldn’t make out the dancers, but it was a unique touch. In another section, a front light highlighted the dancers’ large shadows at the rear of the stage, a play on Indonesian shadow puppetry. Several sources suggest that Gong is influenced by Indonesian culture. Marcelo and Misty Copeland stood out in another darkly lit silent pas de deux which featured difficult multiple lifts from arabesque. Herman Cornejo made an appearance, with seven jazz-style pirouettes. Gillian, Marcelo, Misty, Stella, and Whiteside earned their pay Friday as they were featured in both Bach Partita and Gong, both difficult and tiring works. Gong was entertaining with comical costumes, varied dance patterns and themes, ranging from fast paced action set to loud music to slow pas de deux in silence to dim lighting. I look forward to seeing it again next Saturday evening, as this is a work that rewards multiple viewings.